Schedules are subject to change, so check back to confirm before coming. Right click on poster to download and save to your computer or print. We receive numerous requests to join in our Summer Concert schedule. There is no charge to the public so all performances by bands and musical groups are pro bono. In some cases we do help pay for transportation costs. Please contact the Natural Resource Management staff at 206-789-2622 x214 to see if your group can be added to the schedule. 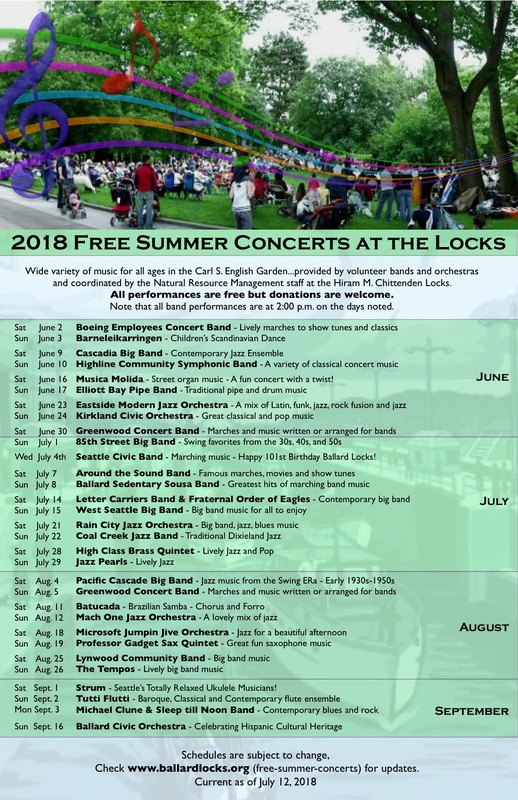 Donations are welcome to help offset expenses for performers, care and maintenance of the Carl S. English Garden and also for much needed renovations at the Locks. Donations may be made on-site or via Eventbrite.